This summer’s soccer scene has been one of the busiest summers due to various international tournaments – UEFA Euro 2016, Copa America, and now Rio Olympics. Putting all the international scenes aside, European leagues are about to have their seasons started. Barclays English Premier League has started this past weekend after last season’s dramatic story from the champions Leicester City FC. It was one of the most unexpected champions in the history of soccer. However, it may have been an expected success from the club’s developmental point of view even if the outcome was perhaps more extraordinary than its expectation. There are many different opinions about the reigning champion and the reason for their success. I wanted to look at its success as a magical blossom of implementing a high performance model over the course of the years. Reading through the fairytale of Leicester City FC, one of the most interesting things I have found was that most of their backroom staff stayed as Claudio Ranieri took over the manager’s seat from Nigel Pearson just before last season started. In many cases where there is a change in the managerial position, the new manager brings his own staff with him. The backroom staff – management staff, scouts, match analysts, sport scientists, strength and conditioning coaches, physiotherapists, sport psychologists, nutritionists – have all been praised by the media for their ecstatic success (Singer – Dailymail, 2016), most of them (only two came over with Ranieri) carrying over the work that had been processed under Pearson, blending well into the new system from Ranieri. Thai owner, Vichai Srivaddhanaprabha, had huge trust in his staff. Pearson, who helped the club to get promoted to Premiership in 2014 and had a greatest escape from the relegations in 2014/15 season that created the momentum of the club’s success through the last season, implemented a crucial philosophy with this backroom staff that initiated high performance model of the club’s success. In a talk after the promotion to the Premier League in 2014, Pearson stated “If everyone improves by a couple of percent, it very quickly adds ups. That is really what it’s about” (Jackson & Aloia – BBC Sport, 2014). This type of training philosophy is mostly acquired in sports like track and field or any other performance based sport where the winning and losing is separated by a very marginal difference of time frame. In those sports, when athletes are at the highest level, the performance gains are very small at a time but it is important to have marginal gains progressively over time to add up. 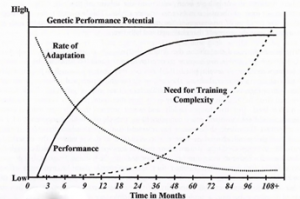 As the graph shows below, the performance increment is huge at the beginning but becomes marginal as it gets close to the maximal potential (highest level); the rate of adaptation is high at low performance, but drops as the performance improves. Having the philosophy of ‘marginal gains’ over time as a motto, every staff from the club worked toward the same goal. To work towards the motto, sport science plays a huge role. 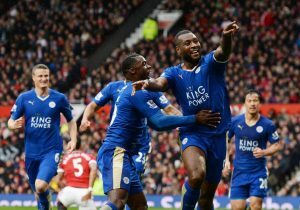 The statistics of Leicester City FC was very unique compared to statistics from most of other champions from previous years. In the game of soccer, the champion teams usually dominate over many soccer specific technical statistics such as ball possession and percentage of successful passes; Leicester City FC was at the bottom of the table for those two statistics (18th with ball possession with 44.8%, 19th with pass success % with 70.5%). The statistics they dominated were more geared toward the performance-based stats. They were tied at 1st for tackles (22.9/game), 1st for interceptions (21.6/game), 1st for passes blocked (11/game), 1st for crosses blocked (4.4/game), 3rd at shots blocked (4.4/game), 4th for aerials won (18.8/game) (stats from whoscored.com). 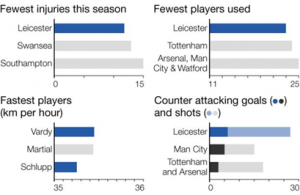 Also, according to physioroom.com and Magowan (2016) from BBC Sport, Leicester City FC had fewest injuries, fewest players used, some of the fastest players recorded for the season, and most number of counterattack goals and shots. From the statistics, their game plans/training goals are clearly visible. Using various resources from sport science data and expert coaches/backroom staff in respected fields, the team was able to achieve those key statistics over the course of the season. Magawan (2016) from BBC Sport had an article about the sport science behind the success of Leicester City FC, the champions have used various athlete monitoring, training, and recovery means and methods along with sport technology such as NordBord for eccentric hamstring load, sprint training, GPS Catapult system, daily wellness questionnaires, and cryotherapy ice chamber. These are not eye opening or totally innovative methods, by any means, in sport world nowadays. Give full credits to Pearson and Ranieri that they appreciated and actually listened to their supporting staff and made the maximal use of the resources and experts. Many of the top clubs have access to the same or even better sport technologies and resources. In most cases, teams or managers never really utilize those resources around them properly and stay with their traditional means and methods. 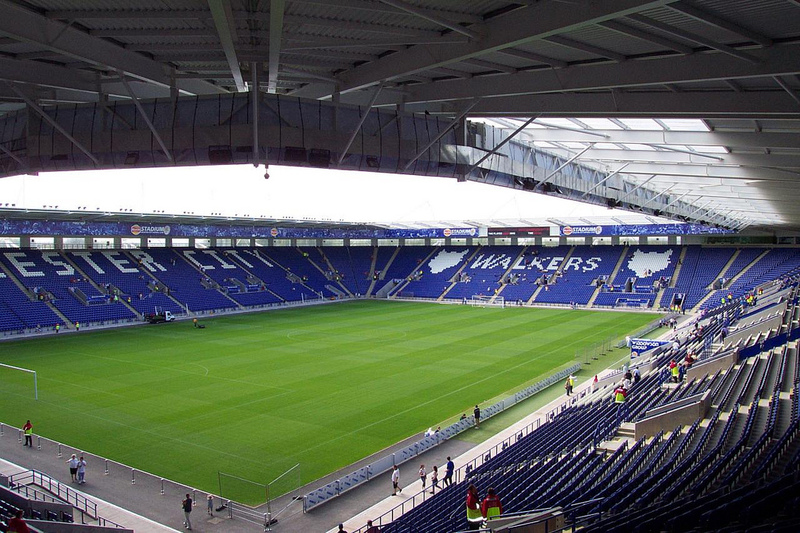 From a sport-science/performance point of view, the story from Leicester City FC sends a strong message that proper application of sport science and its application to training means/methods could make a significant impact on soccer – many people would argue that the importance of the technical/tactical aspect of the game outweigh physical performance in sport like soccer, but it has marked a milestone overcoming the technical stats to become the champions. The argument here is that technical/tactical aspect of the game is important, but physical performance and its application to training cannot be overlooked. Although there were some tactical plans like focusing on strong defensive shape and counterattacking were involved with Leicester City but it could not have been possible without proper monitoring and training plans that kept athletes fresh, strong, speedy, and injury-free.